Book your hotel room prior to February 14 for the 2019 AQHA Convention to receive a special rate. Convention pricing will increase after January 31, 2019. The American Quarter Horse Association is an organization that works for its members. Each spring, AQHA holds an annual convention to review member-submitted rule changes, appoint new AQHA directors, induct new members into the American Quarter Horse Hall of Fame and elect the AQHA Executive Committee. The 2019 AQHA Convention is March 8-11 at the Omni Fort Worth Hotel in Fort Worth, Texas. Register for convention by January 31 to avoid late fees. Attendees also have the option to purchase tickets for the much anticipated Hall of Fame Induction and the Boot Scootin’ Foundation, featuring Asleep at the Wheel, hosted by the American Quarter Horse Foundation. Sign-up for the guided Horse Farm Tour on Thursday, March 7, from 8:30 a.m. to 4:30 p.m. During the guided tour, you will enjoy beautiful vistas and relaxing backroads and will see miles of pipe-and-rail fencing, gorgeous countryside, impressive barns and lots of horses. The Horse Farm Tour is $45 per person and includes lunch. You can also relax, unwind and enjoy a selection of wines and light hors d’oeuvres at the Wine Thief, conveniently located in the Omni Hotel adjacent to Bob’s Steak & Chop House. The Wine Tasting is Saturday, March 9, from 2 to 4 p.m. and is $40 per person. You must sign-up for both of these events by March 1. View the tentative convention schedule at www.aqha.com/convention. Members can register for the convention online. Convention pricing increases after January 31, 2019. For registration questions, please contact AQHA. Hotel rooms for the 2019 AQHA Convention are filling up fast. The room rate is $219 for a single/double. To receive these rates, reservations must be made prior to February 14, 2019. To book a room at the Omni Fort Worth Hotel, visit www.aqha.com/convention. For detailed information and the tentative schedule www.aqha.com/convention. The requirement for ASTM/SEI-approved helmets in all youth English classes is effective January 1, 2015. Effective January 1, all exhibitors in youth English classes will be required to compete in an American Society for Testing and Materials/Safety Equipment Institute-approved hard hat with harness. This requirement will apply to both flat (hunter under saddle and hunt seat equitation) and over-fences classes. The hard hat requirement is an amendment to Rule SHW320.2 in the AQHA Official Handbook of Rules and Regulations. The amendment was announced December 13, 2013, after it was approved by the AQHA Executive Committee. The amendment was a recommendation from the AQHA English and Dressage Subcommittee, and it was approved by the AQHA Show Council. 'Exhibitor safety is a paramount concern at AQHA events,' said AQHA Executive Director of Shows and Judges Pete Kyle. 'This amendment solely affects the youth division, and in so many other sporting events, youth wear safety helmets, so this really is about safety first,' Kyle added. Per Rule SHW320.2, amateur competitors are required to wear approved helmets in over-fences classes. 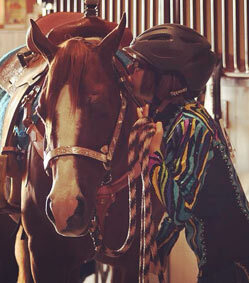 Although helmets are not required in other AQHA classes, riders are encouraged to wear protective helmets at their discretion. AQHA News and information is a service of the American Quarter Horse Association. For more news and information, follow @AQHAnews on Twitter, watch the AQHA Newscast and visit www.aqha.com/news.